In case you were hurt in a motorcycle accident in South Beach, then you’ll need the best Miami personal injury lawyer to serve your interest and help you get justice and proper compensation for your harms and losses. Our South Beach motorcycle accident attorneys at the Wolfson Law Firm are here to help. Our bilingual staff has assisted South Floridians seek damage recovery from motorcycle accidents for more than 50 years. Call us at 305-285-1115 for free consultations. There is no obligation for you to hire us after the consultation. You have the right to be informed about your rights and possible outcomes, so we will answer all your questions related to your accident and injuries sustained. When you think of South Beach, you mostly think about beaches, bars and restaurants, but South Beach is a whole neighborhood in Miami Beach in Miami-Dade County. 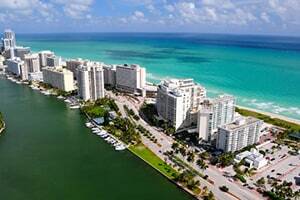 Often referred to as SoBe; it is located on the Atlantic Ocean shore on the east and the Biscayne Bay on the west side. South Beach has been the first Miami Beach neighborhood to be developed, starting back in 1910. It survived a major drawback in 1926 when it was hit by a hurricane, and it kept developing afterwards. It has gone through several changes throughout the years, and now hosts a booming economy supported by tourism. There are many neighborhoods within the South Beach neighborhood. These are City Center, Belle Isle, Star Island, South Pointe, San Marino Island, Rivo Alto Island, Flagler Monument Island, South of Fifth, Palm Island, Hibiscus Island, West Avenue Corridor, and Di Lido Island. The most famous landmark of South Beach is probably Ocean Drive, a road that connects the 15th Street to the southernmost point of the main barrier island of Miami Beach. It drives along the Atlantic coast, offering amazing ocean views from one side, and nice buildings from the other side. Remember that calling a lawyer as soon as possible can be essential to get the compensation you deserve. People and insurance companies won't pay you damages voluntarily. You'll have to fight for it. Of course, in a situation when you have suffered injuries due to an accident claiming damage recovery may not be the first thing that comes to your mind, but if you have injury-related financial losses caused by the negligence of others, then it is just and right to seek financial compensation. The South Beach motorcycle accident lawyers at the Wolfson Law Firm have 50 plus years of experience in this field. Let us help you and your family. We handle cases on a contingency fee basis, which means that you won't pay any attorney fees unless we recover for you. Call us at 305-285-1115 for free, confidential and obligation-free consultations. We will inform you of the details about your rights and possible outcomes, and if you're happy with that, we will get to work.